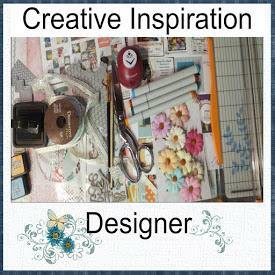 Today I created a layout for a challenge for the mini crop at Creative Inspirations as well as for the new sketch at Sketches in Thyme. The Challenge at Creative Inpsiration is to have a pet in your layout and I incorporated my baby Oliver (Ollie) in the sketch, to cover both challenges. Ollie has been sick for over a week and while he was sick he would only sleep on the floor at the end of the sofa, so when he jumped up in my lap the other day, I knew he was well on the road to recovery and I was so happy it was hard to hold back the tears. Ollie has been the most loving cat I have ever owned. He wants to be with me wherever I am and whatever I am doing, especially if I am scrapping, so when he didn't want to get up with me, it hurt to know that he was hurting that bad. He had a lot of fluid in his upper abdomen cavity, but we don't know how it got there and he didn't eat for a and didn't drink so he became dehydrated requiring IV fluids and several blood tests and X-rays over time to keep check on his abdomen to see how the fluids were doing in his abdomen. It required a lot of medication and if you have ever had a sick animal you know that these things come with a high cost. So I was very happy when every thing was cleared up, so was my bank account. 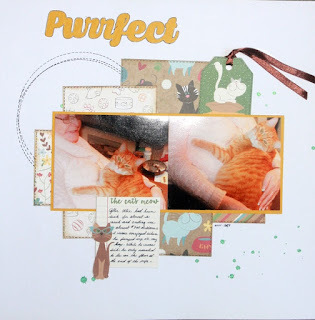 For this layout I used Photo Play Roxie and Friends papers. Thanks for stopping by. Please leave a comment to let me know you were here. I love reading your comments. What a cute layout Jackie! So glad Ollie is feeling better. What a cutie! Love the playful title. Thank you for joining us at Sketches In Thyme.